Read the 117 Articles of the Iroquois Confederacy Constitution. The Iroquois Confederacy was a powerful confederation of Native American Indians which was originally composed of 5 tribes consisting of the Mohawk, Oneida, Onondaga, Cayuga and Seneca people. The Great Law of Peace was the basis of the Iroquois Confederacy Constitution which was brought to the tribes by the prophet Deganawida and his spokesman, Hiawatha. The Iroquois Confederacy Constitution was also known as the "League of Peace and Power". Deganawida and Hiawatha brought about an alliance of the Iroquois tribes by bringing a message, known as the Gayanashagowa or the Great Law of Peace, to the warring Iroquoian nations. 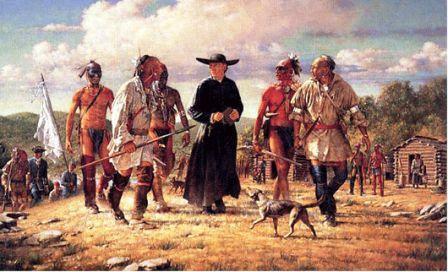 The Great Law of Peace was the basis of the Iroquois Confederacy Constitution. The Great Law of Peace or the Iroquois Confederacy Constitution is divided into 117 articles. Read about the History and Founding of the Iroquois Confederacy and discover interesting facts and information about the founders Deganawida the Great Peacemaker and his spokesman Hiawatha, the tribes of the league, where they were located with a map for reference, the People of the Longhouse, the Hiawatha Wampum Belt, the Tree of Peace, Great Law of Peace and the Great Council. The democratic ideals of the Gayanashagowa (Iroquois Confederacy Constitution) provided inspiration to Benjamin Franklin, James Madison and the other great authors of the United States Constitution. Many of the articles are very similar but there is a major difference between The Great Law of Peace and the original US Constitution. This was the original denial of suffrage to women, and rule of majority as opposed to consensus in the US Constitution. The women of the Iroquois tribes exercised great influence in the government of the people. Elderly women had the right to sit in the councils and the power to exercise a veto on a declaration of war. The women were also allowed to demand a cessation of hostilities. In October 1988, the US Congress passed Concurrent Resolution 331 to recognize the influence of the Iroquois Confederacy Constitution upon the US Constitution and Bill of Rights. The Iroquois Confederacy Constitution. Discover the vast selection of pictures which relate to the History of Native Americans. The pictures show the clothing, war paint, weapons and decorations of various Native Indian tribes that can be used as a really useful educational history resource for kids and children of all ages. 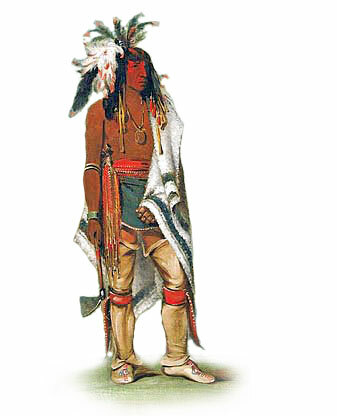 We have included pictures and videos to accompany the main topic of this section - Iroquois Confederacy Constitution. The videos enable fast access to the images, paintings and pictures together with information and many historical facts. All of the articles and pages can be accessed via the Native Indian Tribes Index - a great educational resource for kids.